South Place Lofts are located on the top floor of the hotel with floor to ceiling windows and views out over London’s rooftops. Each one features a queen size bed, slate rain shower, a large working desk and unique art work. A perfect place to settle above the City. Our Lofts provide complimentary high speed internet, a fully stocked mini bar and a B&O television - with a selection of Blockbuster movies to keep you entertained. When booking direct, you will also receive exclusive benefits to help you make the most of your stay. As functional as they are stylish. 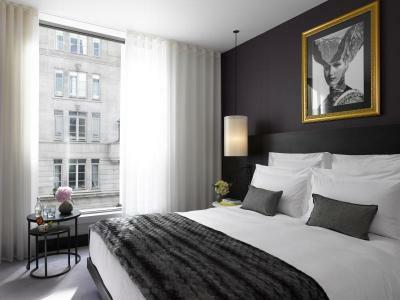 South Place King rooms have floor-to-ceiling windows and full length mirrors to give a feeling of light and space. 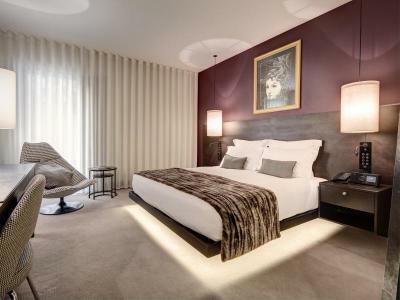 Each one features a king size bed, a marble bathroom with a luxurious deep bath tub, a large working desk and unique art work, making them great for work or play! Each room provides complimentary high speed internet, a fully stocked mini bar, a B&O television with Blockbuster movies. Plus when booking direct you will receive exclusive benefits to help you make the most of your stay. Bright and airy, the South Place Twin rooms have two single beds, a large working desk and extensive wardrobes to offer plenty of space. Each one features a marble bathroom with a luxurious deep bath tub. Great for sharing, the rooms offer high speed internet, a fully stocked mini bar, a B&O television with complimentary movies. Plus when booking direct, you will receive exclusive benefits to help you make the most of your stay. 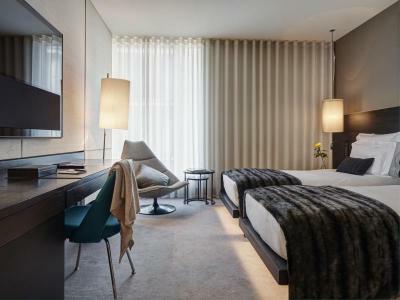 Our luxurious Eldon bedrooms offer king size beds for those looking to relax, with a marble bathroom and combined bath and shower, complimentary soft drinks from the fully-stocked mini bar daily, shirt pressing and a B&O television with Blockbuster movies. For those needing to work, the rooms provide a large working desk with a media hub, unique art work and high-speed internet. When booking direct, you will also receive exclusive benefits to help you make the most of your stay. Located on high floors, experience a Wilson, one of our most spacious bedrooms, with super-king size beds, vast wardrobes and a practical working desk. The marble bathroom features an extravagant walk-in shower & a bath tub fitting for two. Each room provides complimentary high-speed internet, soft drinks & snacks from the fully stocked mini bar, and a B&O television with Blockbuster movies. When booking direct you will receive exclusive benefits to help you make the most of your stay. Beautiful spaces with the proverbial red carpet rolled out. Our studios are essentially apartments in their own right, positioned on each of the corners of the hotel. 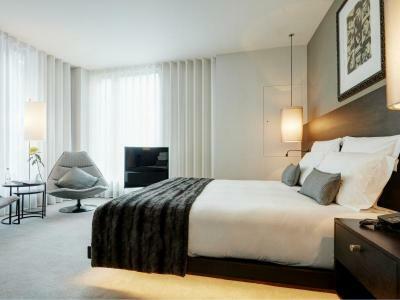 The bedrooms are open-plan with super king-size beds, a seating area, extensive wardrobes and desk space. The spacious bathrooms have the best of it all, with a deep bath tub and a luxury rain shower, as well as dual sinks. Sit back on the deep sofa and enjoy complimentary soft drinks and snacks from our mini-bar, as well as exclusive book direct amenities, so you can settle into your new home in the City! 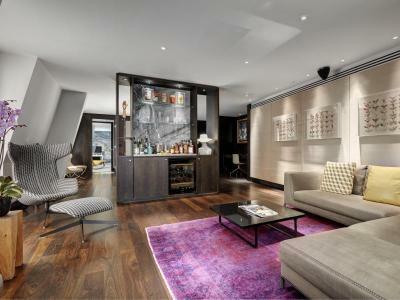 This exclusive one-bedroom suite is perfect in design and space – larger than most London pads! 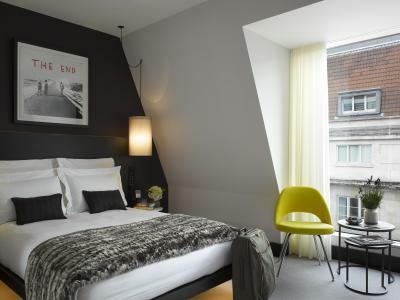 Located on the top floor of the hotel, with dual aspect views whilst looking down on The City of London. With an open-plan living space, furniture designed by B&B Italia, a dining table for eight guests, as well as a kitchenette and guest bathroom. 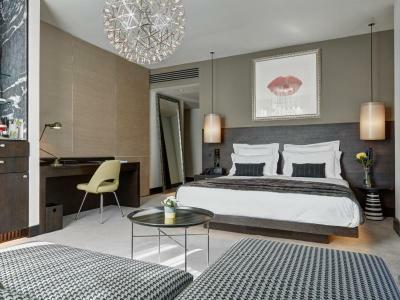 Suite 610 is perfect for a relaxing stay or mixing work with pleasure! Experience the bedrooms in full swing, with its super king size bed, unique free-standing glass bath and TV, complimentary soft drinks and snacks from the mini-bar - and all the added extras you deserve.